Modern Muse, a UK-based charity, lifted their existing AWS solution and shifted it to Azure without significant code changes. At Weston Technology Group, LLC., we can help you in your migration journey also. You'll be amazed on what you can accomplish with tools like Azure. Contact us today to learn more. Modern Muse, a UK-based charity designed to inspire and engage the next generation of female business leaders, needed to create a modern platform that could scale and grow with the organization. 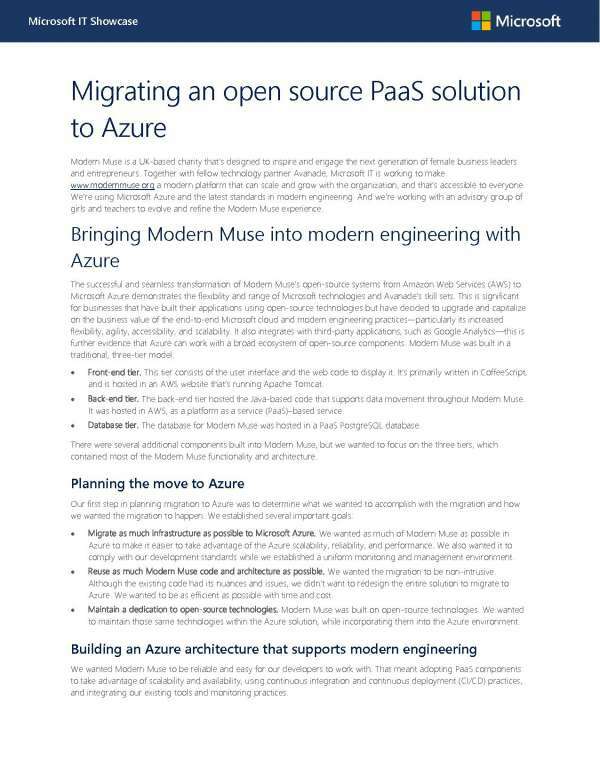 Modern Muse migrated to Azure from an AWS platform. It wasn't easy, but they were able to realize real benefits like standardized monitoring and management of their infrastructure. At Weston Technology Group, LLC., we pride ourselves in knowing the latest tools and techniques when modernizing IT infrastructure. If you're looking for a solution that can help you scale and grow your company, we'd love to help. Contact us to learn more.